Following a breakeven day yesterday, the FTSE, CAC and DAX all opened this morning in positive fashion, rising by around 0.3% with the commodity heavy FTSE benefitting from a major boost to one of its main components, BP. 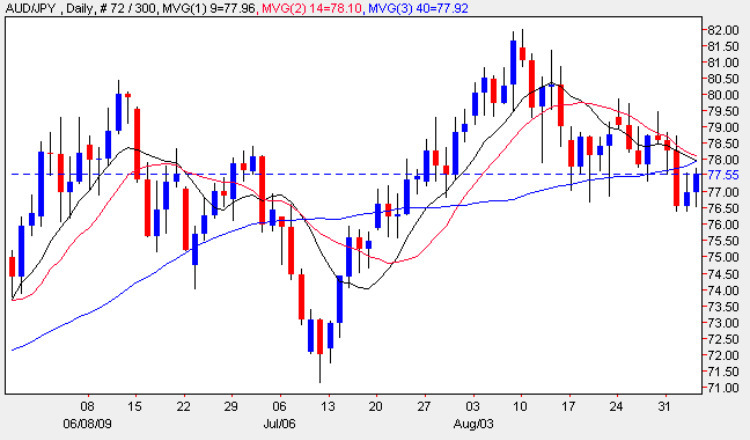 Meanwhile the US markets and the Nikkei fell again last night, but the losses were not in the same league as Monday’s sell off. This morning we have UK services PMI at 08.30 GMT followed by European retail sales at 09.00 GMT. The main announcement today is the latest rate decision and accompanying press conference from the EC at 11.45 and 12.30 respectively. Rates are widely expected to remain at 1% so the biggest moves could come from the accompanying statement or press conference, especially with regard to quantitative easing. Following this we have US unemployment claims at 12.30 then ISM Non-Manufacturing PMI at 14.00. This morning we have seen a renewed appetite for risk with the yen and dollar firmly on the back foot. Sterling looks to have the edge over the dollar, rising slightly higher against both the dollar and yen. However, it’s the commodity pairs of the Canadian dollar and Australian dollar that are setting the pace today. The AUD/JPY has risen 0.74% so far today. In the medium term the trend is mixed for the AUD/JPY so further upside today could be muted. A good way to play this might be a double (down) trade which returns 100% if successful.